The Volcom Shadow Jacket is a fully insulated jacket that is surprisingly light. It has a regular fit with room to layer and is nice and long in the torso, and fully taped seams as well. Would be a good choice if you are looking for a jacket for the cold days but not looking to ride in those wet storms. The hood fits great over a helmet as well for those cold chair-lift rides or storm riding. We doubled down on the reviews and did a repeat with a different color, so you have both of those below. Fit: The Shadow jacket has a nice tailored fit with a mid-thigh length in the torso. The arms are a nice length as well so you won’t get any wind draft or snow in there. Construction: Looks to be very well made and seems like it would last a long time. Hood: A nice fitting contoured hood that has a removable faux fur lining. There was a good amount of room for turning my head with a helmet on, but it also had a nice seal when I tucked down into the jacket. Insulation/Warmth: With 80g of insulation, the Shadow jacket should keep you pretty warm on the cold days, and there is also room to layer if its super cold out. Waterproofing: 15k waterproofing should work good for most normal days and even colder storm days. Might get a little wet on those soggy storm days though. Packability: Not really made to pack down, but the insulation is pretty compact and flexible. Overall: A nicely made jacket that should work well in most conditions and has a good amount of insulation as well. It looks great and has a nice fit to it with plenty of length to keep the snow out of your pants. Also, the color is an Evo exclusive color, but it comes in a few other choices as well. 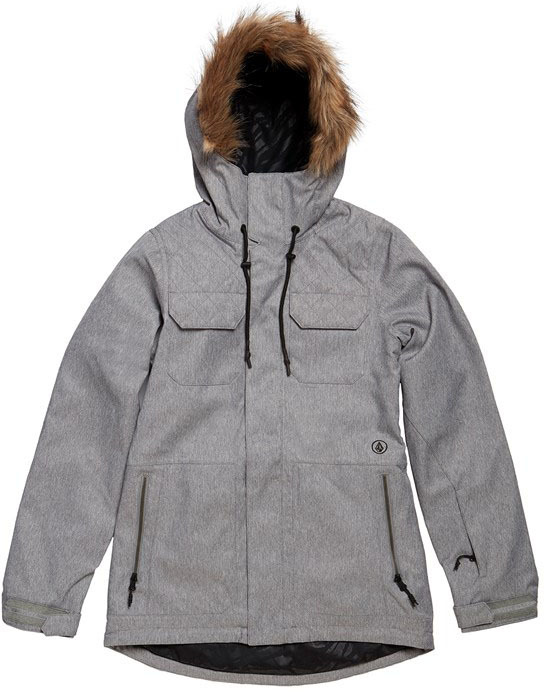 We try to get as many images of the Volcom Shadow Insulated , but forgive us if they're not all there.